A new Apple call waiting patent may put an end to having nothing to do when you're put on hold except watch the call minutes tick away on the screen. U.S. Patent No. 8,412,164 suggests that future iPhones and Apple devices could serve up "adaptive information," including important data about the caller. "Adaptive information can be different from traditional static information, which is information that remains fixed or the same," reads the patent first spotted by Apple Insider. Currently, static information during iPhone voice calls consist of the call's length, name of the person on the other end of the connection, and the other user's photo. Instead, the contextual call waiting feature could display more personal data like past communications between the two callers or future appointments. 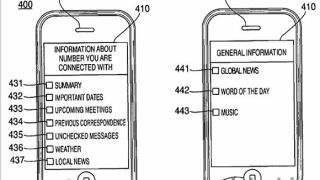 "Such adaptive information can include, for example, the name of the person's spouse and children, the date of their birthday or their hobbies," the new Apple patent indicates. "A system can also identify any unsuccessful attempts to communicate (e.g., unanswered calls, voicemails, unread emails) with another person and present a user with adaptive information related to those attempts." The adaptive information of this call waiting patent is meant to prepare a user for the rest of the communication. However, it could also bring up general data to pass the time, including the weather forecast and news headlines through both graphical and audio signals. Interestingly, the time of day could affect the contextual call waiting information. "If a user is put on hold early in the morning, the presented information can be a highlight of the events on the user's calendar for that day," the patent suggests. "Moreover, if the user is put on hold late in the evening, the presented information can be a summary of the day's news or a summary of events scheduled for the next day." Of course, while this call waiting feature could find its way to iOS 7 when iPhone 5S or iPhone 6 are announced, Apple could ironically put the idea "on hold" indefinitely like it does with some many other patents.